What's Going on With Harry's Pants? There are two possibilities, here. Scenario A: Harry is comfortably out of the line of succession. He’s the hip redheaded uncle to the heirs. He figures he doesn’t have to wear a fusty musty suit. He’ll go casual—jeans, that’s the ticket. Jeans, to meet with the Americans. He does not consider that he’ll be lining up for a photo with two women who dress under the assumption that every facet of their outfit will be nitpicked to death and two men who select their suits knowing they’ll be worn to meet with world leaders. 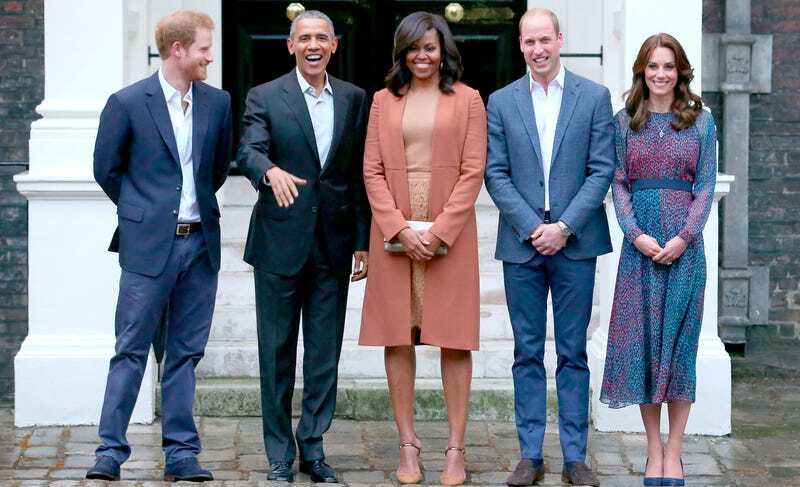 Even George looks better-dressed and he’s wearing a bathrobe. A tiny, adorable, oddly regal bathrobe.